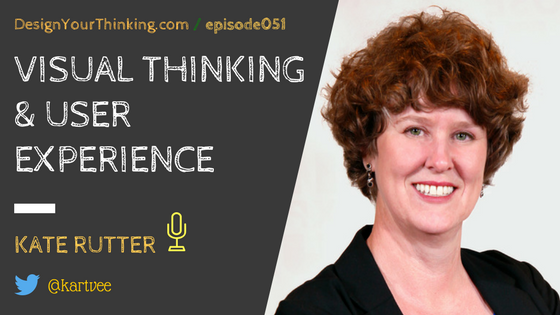 In this Ferris Wheel episode of The Design Your Thinking Podcast, I speak with Kate Rutter who is an entrepreneur, designer and Principal at Intelleto about Visual Thinking and User Experience. Kate is an entrepreneur+designer and Principal at Intelleto, where she creates visual explanations that make complex ideas simple, memorable and shareable. Kate pioneered the UX learning track at Tradecraft, Co-founded Luxr.co, and was Senior Practitioner at UX consultancy Adaptive Path. She co-hosts the popular and not safe for work podcast “What is Wrong With UX” with Laura Klein, her best frienemy. Kate is currently writing a book to help product thinkers sketch with confidence. Who, in Kate’s mind, are the most unorthodox visual thinkers and designers? Who Kate thinks are the most impressive, lesser-known teachers in visual thinking and design? What makes Kate different from other designers, and who have had the biggest influence on her?